Manchester United will reportedly step up their interest in signing Kalidou Koulibaly and Milan Skriniar from Napoli and Inter Milan respectively when the transfer window reopens. 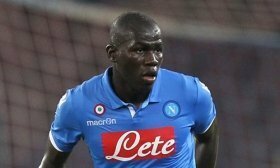 The Red Devils were desperate for a new central defender under the guidance of ex-boss Jose Mourinho and they are said to have failed with approaches for both Koulibaly and Skriniar last year. Due to this, they were fancied to make a fresh approach for either player in January but an offer never came about with the hierarchy reluctant to do business with interim coach Ole Gunnar Solskjaer at the helm. According to The Independent, United could be prepared to invest on the central defensive duo in the summer, once they have appointed a director of football as well as a permanent head coach. However, they are expected to sanction the departure of a few outcasts prior to that with Antonio Valencia, Matteo Darmian and Marcos Rojo among the names linked with summer exits.